Citysearch LA, in their latest Eat, Drink, Learn effort gave us the opportunity to taste gourmet mushrooms prepared with recipes as unique as the mushrooms themselves. The setting was Desert Rose on Hillhurst, normally serving Lebanese fare and the occasion was the launch of Veggie Thing, a website showcasing all lovely things vegan. I am not vegan myself but thought all varieties of the not-plant-nor-animal that were served, however, were delicious – after all, they were gourmet and were provided courtesy of Hotko Kinoko. The “exercise” gave me a real appreciation that funghi can be flavor-packed (and not just because they’re truffles) and perhaps we should come to demand that quality. The starter soup was so delicious, I could have requested another bowl. It was a Beech mushroom lentil soup with smoked paprika oil and baby spinach. The smokeyness was subtle yet savory because combined with Beech mushrooms. 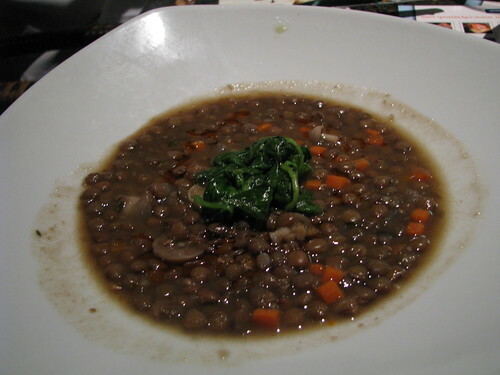 Lentils were just weighty enough to remind you how good it is for you, with the spinach garnish complimenting the bowl well. 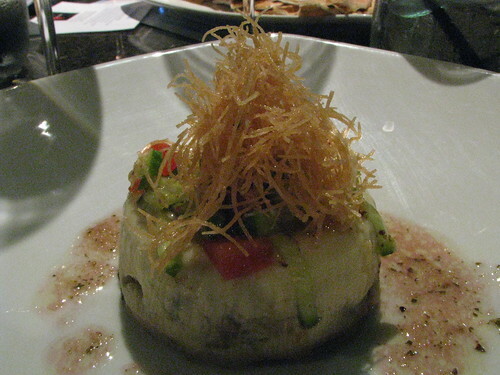 All dishes in the tasting menu were delightfully vegan except the mushroom flan (first picture) – which demonstrated the appeal of having a mushroom-based recipe if one had such dietary requirements. They can also compliment sweet dishes – the lone dish in the tasting of which was Medjool dates stuffed with Maitake mushrooms, walnuts and Daiya cheese. There were a few misses, like a mushroom-filled cabbage roll and a few falafel that I thought were over-fried and a bit too tough – but the hits were savory and a good platform to reexamine the quality of mushrooms. This entry was posted in Events, Food, Los Feliz and tagged Citysearch, CitysearchLA, Desert Rose, gourmet mushrooms, Hillhurst, Los Feliz, mushroom, tasting. Bookmark the permalink.